Some insurers have responded to the rise of scanning by creating their own criteria for when the procedure merits reimbursement, according to an executive for a diagnostics device manufacturer. Drew Technologies business development Vice President Bob Augustine in this week described the sentiment and recent backlash he saw among some carriers. His insights provide perspective collision repairers might wish to consider when discussing their charges with insurers and customers. “The practice of pre and post scanning a vehicle is recommended, but consideration for the repair cycle in between needs to be openly discussed as an industry,” Augustine wrote. Augustine said some insurers started buying scan tools and testing them in summer 2018. After determining that the actual scan itself didn’t take very long, the insurers began to seek guidance from third parties on best practices for vehicle scanning, according to Augustine. “The subject-matter expertise resides with the tool manufacturers, who have been servicing the mechanical sector for the last 15 years, and most have since contributed to the conversation,” he wrote. As Augustine described it, carriers concluded they didn’t mind paying for a scan if the vehicle met certain criteria, such as a damage threshold or the existence of pre-defined on-board technology, such as advanced driver assistance systems. But they weren’t going to pay automatically across the board every time a technician connected up a tool. 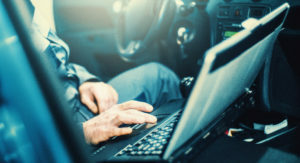 “Because a vehicle is normally scanned multiple times during a collision repair as components are disconnected and/or replaced, guidelines on what was billable needed to be established,” he wrote. However, he said the high-level technical staff at large carriers he regularly interacted with did support adherence to OEM procedures following the John Eagle lawsuit. “Post-John Eagle, the main carriers are actually moving toward the OEM positions, not away,” Augustine wrote. Asked about high-level claims staff calling for case-by-case scans in defiance of OEM positions, Augustine said he couldn’t speak to which segment’s policies would prevail. He also warned against generalizing, noting that all of the major insurers he talks to have their own cultures and personalities. A big part of working with carriers might be explaining what Augustine described as the difference between scanning and diagnostics. The actual scan might be quick, the real work of interpreting and acting upon the results might be “the other 50 minutes,” he said. A mechanical repairer, for example, might allot a technician an hour for diagnostics, according to Augustine. This time would take into account a 20-minute process including a scan at the beginning of the repair, another 20 minutes to figure out what was wrong, and a validation process including another scan at the end, he said. The Society of Collision Repair Specialists earlier this year also released a video depicting potential not-included operations associated with scanning a vehicle remotely. While the actual scan itself might be completed quickly, these other factors might be part of the time or fee a shop invoices. Augustine shared some perspective on shop behavior as well. He said Drew Tech, which sells both scan tools and analysis and reprogramming services (it owns Autologic), is encountering difficulty selling to some MSOs whose technicians bought aftermarket scan tools when the company wouldn’t purchase such equipment itself. The technicians want to be paid an hour to hook it up, and the shops are afraid to tell the technicians they can’t have the hour anymore, he said. “A common practice now is to be reimbursed ½ hour for a Pre or Post scan because the technician is not doing diagnostics in either of those use cases,” he wrote. Another shop issue Augustine sees involved estimators who don’t want to alter their workflow to scan a vehicle. This leads to supplements when problems are caught later — something insurers loathe.